These essay questions show that MIT seeks applicants who have the judgment and practical skills to take on the challenges that will fly at them as they re-define industries and functions. 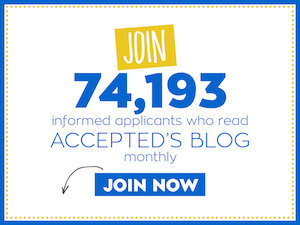 Applicants who push the boundary of what’s possible and provide “principled leadership” amidst a torrent of change. The essays (including Statement of Purpose) are your main means to show that you possess the qualities that indicate fit for MIT EMBA: leadership impact, global mindset, functional depth, and experience with innovation. While the statement of purpose challenges you to succinctly create your applicant portrait, the two essay questions probe how your perspective, ideas, and thinking lead to specific impacts and outcomes. As always, MIT Sloan is interested in what you’ve done – actions you’ve taken and impacts you’ve created – based on your reading of a situation. Notably, in two out of the three writing prompts, the question refers to the program’s culture and values. There is no one formula for these elements (I’ve seen people with vastly differing views of what an “improved world” would look like be admitted); the key is that you have such a dimension in your goals and life. Ensure your essays portray your fit in this regard. In an overall plan for the essays, the statement of purpose works as a positioner, an opening pitch, a frame. In each of the two essays, strategically select experiences that show different facets of you to give a comprehensive view. Also, if possible, discuss a recent experience in at least 1 of the essays, to allow the adcom to see you working at a high level and to show what you’ll bring to the table. This is your portrait – your candidacy at a glance. It should convey a vivid, immediate sense of you as a person and as a candidate for this program. It should go beyond just facts to present a point of view and a message (theme). Determine your message first, before drafting the essay, and let it guide you in selecting and elaborating the content details. Beware of a potential pitfall: in discussing the requested examples of success working with organizations, groups, and people, do not repeat your resume in prose format. Select your examples thoughtfully, focusing on those that (a) are truly distinctive and relevant to the EMBA and/or (b) support your goals directly or indirectly, and (c) reflect your message. Make a short, meaningful point about each, such as the insight it lends or its influence on you. For why you are pursuing the EMBA, of course you’ll discuss your professional goals and objectives. Focus not only on what you want to do, but also why — what you want to accomplish for the organization and/or its customers/market (your “vision”). The contributions should reference your experience from work or outside work; think of what about you would be most meaningful and interesting to prospective classmates. This element of your response is an opportunity to show that you understand the program. In answering this question, clarify what “principled, innovative leader” and “improving the world” mean to you. These points represent your point of view, your perspective – they should be short (sometimes even a phrase suffices), but without them this essay lacks focus. The bulk of the essay will focus on action – your examples of past work and activities that make the case for how you have been, and will continue to be, a principled, innovative leader who improves the world. The key to making this a gripping, memorable essay is strong experiences and examples combined with your reflection on them pertaining to the essay’s theme. End by briefly discussing how you will build on these experiences to be such a leader in the future. This question requires you to combine two realms: thought (idea) and action (you introduced…). MIT Sloan seeks people who have strength in both areas – who have vision and can execute that vision. A suggested approach is to draft it straightforwardly, as a story: start with your idea and what prompted it, and then narrate your action – how you introduced the idea, and how you implemented it. Conclude with the results, clarifying the change in approach to the opportunity or challenge. There are 2 ways to make this approach work. Option A: As you narrate, include and “zoom in” on factors you considered and the barriers you encountered in the process; make them part of the story. Option B: narrate the story, and then in a concluding paragraph discuss the factors you considered and the barriers/obstacles faced. 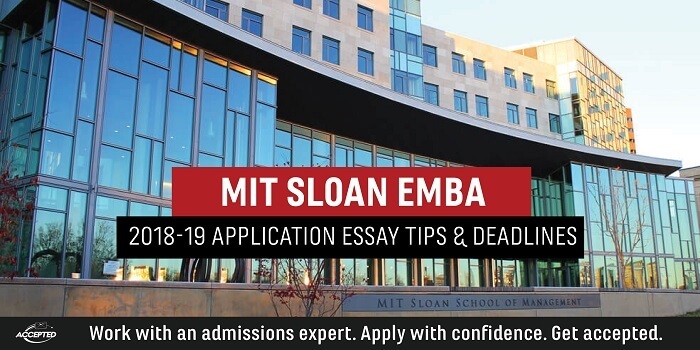 For expert guidance with your MIT Sloan EMBA application, check out Accepted’s MBA Application Packages, which include comprehensive guidance from an experienced admissions consultant. We’ve helped hundreds of applicants get accepted to MIT Sloan’s EMBA program and look forward to helping you too!